Everything about him had seen better days. Once upon a time, his bowtop showman’s caravan had been garishly painted in all the colors of the rainbow. Now the colors had faded, bleached out by the desert sun, rubbed off by the hot dust that the winds carried along, or even washed away by the occasional rainfall. Once upon a time, the man had been handsome. Now the girth around his waist, the suspicious red and blue color of his nose, and the breadcrumbs in his twirled moustache and braided goatee made him look less appealing. Even his clothes were an amalgamation of once upon a time and past glories. He wore the top hat of an Imperial gentleman that had gone from shiny lacquered black to fading grey, the strings of beads and talismans wrapped around it now adding a sense a cheapness, rather than class. His shirt and leather vest had been stitched and repaired so many times that it was more the blessings of various gods than craftsmanship that still held them together. The boots and pants had seen service in the Imperial army even before the Peerless Seven had made their stand against the Throne. Yes, Doctor Adebar Jade looked like a wash-out, a has-been (assuming he had once been someone to begin with). Today the has-been had the feeling that he’d watched a legend about to begin. Either that, or a tragedy in progress. She was a slip of a girl, fifteen or sixteen years at most, thin as wire and just a touch over five feet in height. She wore no shoes, only the baggy pants and cotton shirt of much taller man — the same man whom her floppy broad-brimmed felt hat belonged to. The six-shooter at her waist seemed comically huge, way too big for such a small girl to carry around, let a alone draw — even if she used both hands. That’s what a pair of bushwhackers drunk on cactus wine and mischief had thought too. They had bragged about taking the girls gun first and her innocence second. Now both were very quiet. Now both had fine little holes in their foreheads, turning blue and black around the edges while bright red blood pooled under their heads, a stark contrast to the yellowed sands that surrounded them. Few people in Birds Bridge would shed a tear about these two jokers. They had been a pain in everyone’s necks: harassing shopkeepers, chasing skirts, beating up husbands. However, being bully-boys more than killers, and mischievous more than truly evil, they had never crossed the line to take a life. They had been young, too: just a few years older than the little girl with the big gun. A healthy lesson or two could have turned them around for good. That had been Adebar’s plan: step in to protect the girl and teach a lesson. Unfortunately, it is difficult to educate someone when his brains are blown out of the back of his head. The crowd before Tao’s stable parted wide as the girl calmly walked out with her pinto horse following behind. She seemed to have forgotten the whole incident. Neither the two dead men concerned her, nor the possibility of legal retribution. An adolescent legend. Or maybe an adolescent nightmare. He caught up with her on the small bridge that had given the town of Birds Bridge its name. She did not acknowledge the caravan, or the man driving it, until Adebar spoke to her. “You were there. You know.” She had the clear silver voice of a singer, but devoid of all emotion. “Or they might have learned,” Jade suggested. “Or they might have gotten worse,” came the reply. “I have more faith in the dead than in the living,” the girl responded. They had crossed the bridge. The girl dug her heels into the sides of her pinto and the horse galloped off. Soon she was only a dust cloud approaching the horizon. She had outrun Adebar. 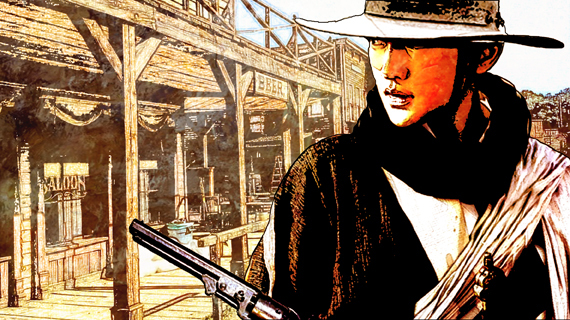 This vignette was crafted by a FAR WEST fan, and serves as a preview of the fan participation in the FAR WEST setting that is available to members of the Far West Society. A resident of Germany, Marco Mueller has been playing tabletop RPGs since the mid-eighties and writing in several PBEMs–most notably Star Trek and Vampire.The Masquerade–since the late nineties. This is his first official contribution to a published setting.